I have an Infotec 3030 copier. Will the Ricoh Aficio 3030 printer cartridge fit it? Unfortunately, the Ricoh Aficio 3030 cartridges are not compatible with your printer and we do not stock the cartridges for the Infotec 3030. The Ricoh Aficio 3030 is a multifunctional copier with many document management options to suit the needs of various types of offices. 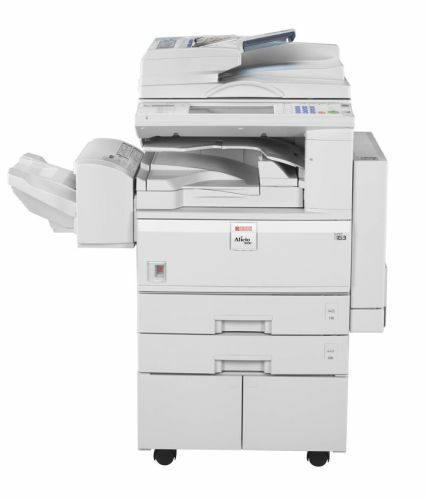 It is a standard copier with a 30 ppm copy rate, good for desktop or standalone operation. It has printer, scanner, fax, and even PC-fax options. It is very compact and even supports automatic duplex copying and printing of wide format documents up to A3 in size. The Ricoh Aficio 3030 multifunction printer is a good investment for offices in need of a good copier that offers multifunction options. However, the Ricoh 3030 laser printer can only produce monochrome outputs and only it offers networking as an option. The Ricoh Aficio 3030 black and white copier looks just like a typical copier printer. It features an automatic document feeder, which sits right on top of the unit as well as an automatic duplexer, which helps save on paper consumption. The Ricoh Aficio 3030 mono laser printer can be used with optional finisher units like the sorter or stapler unit, while the network interface (also optional) can handle up to 5 to 24 users. The best benefits of the Ricoh Aficio 3030 include network capability, and its printing, scanning, and faxing features even though these features only come as optional upgrades. It offers good print and copy speeds and can be used as a standalone device, allowing users to copy documents even without a computer turned on. The Aficio 3030 monochrome copier has handy finishing options, and quality is guaranteed with its digital scanner / copier and laser printing engine. The low-cost Type 2220D toner used by the Ricoh Aficio 3030 printer delivers a cheap cost-per-copy with its 11,000 page print capacity. On the other hand, the Ricoh Aficio 3030 photocopier only prints and copies black and white pages and many features are optional upgrades that cost extra to purchase.